A lonely guy in a serious state of arrested development takes a desperate shot at love in Dark Horse , the blistering new comedy from modern master of suburban discomfort Todd Solondz. The acclaimed nationwide release will hit high-definition Blu-ray and DVD on November 13, 2012, from Virgil Films. Writer-director Todd Solondz's 1995 debut feature, Welcome to the Dollhouse, immediately put him on critics' lists of leading filmmakers, and he has stayed there with such truly original movies Happiness, Storytelling and Life During Wartime. Now, with Dark Horse , he has created his most moving, if still darkly realistic, film yet, a melancholy and idiosyncratic comedy that examines the irretrievability of youth and the mercilessness of time passing. Jordan Gelber (Before the Devil Knows You're Dead) plays Abe, a spoiled Long Island 35-year-old who still lives with his parents, collects action figures, takes money from his mom (Mia Farrow), has a do-nothing job with his dad's (Christopher Walken) little real estate company, wears a rhinestone name necklace and drives a bright yellow Hummer. But the perpetually angry Abe's life suddenly perks up when he attends a wedding and meets the equally miserable (but beautiful) Miranda (Selma Blair, Hellboy, Storytelling). Abe proposes on their first date, but the events that follow suggest Abe may have a very weak grasp of reality; plus, there's the sneaking suspicion that Miranda may really be after Abe's more successful and better-looking brother (Justin Bartha, The New Normal, The Hangover). The New York Times' A.O. Scott raved that "Solondz brilliantly - triumphantly - transforms what might have been an exercise in easy satirical cruelty into a tremendously moving argument for the necessity of compassion. ... 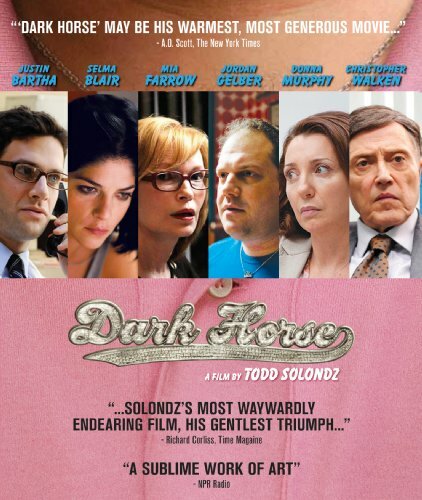 Dark Horse may be his warmest, most generous movie." Time magazine's Richard Corliss called it "Solondz's most waywardly endearing film, his gentlest triumph," while New York magazine's Logan Hill said, "Solondz delivers a timely, critical parable of unjustifiably overconfident American exceptionalism."